Xara have released the latest new version of their creative design and photo editing software, Xara Photo & Graphic Designer. Version 11 adds new Art Brush technology to the Brush Tool, a range of high quality realistic textured brush effects, and the ability to sync files via Dropbox and Google Drive. In the Transparency Tool 5 new W3C standard, web-safe and PDF-safe blend modes have been added - Overlay, Hard Light, Soft Light, Luminosity & Colour. Xara Photo & Graphic Designer 11 costs £49.99/$69.99, and includes two valuable free additions – the Premium version of MAGIX Online Photo Album to share photos with friends and Photolooks 2, a powerful and flexible plug-in (previously sold by Red Giant for $199) that can change the colour and light effects in a photo. In this release there’s a big step forward for the Brush Tool with new Art Brush technology that smoothly stretches either vector or bitmap, in real time, along a freehand drawn line. We include a range of high quality realistic textured brush effects emulating paint, chalk and water-colour effects. 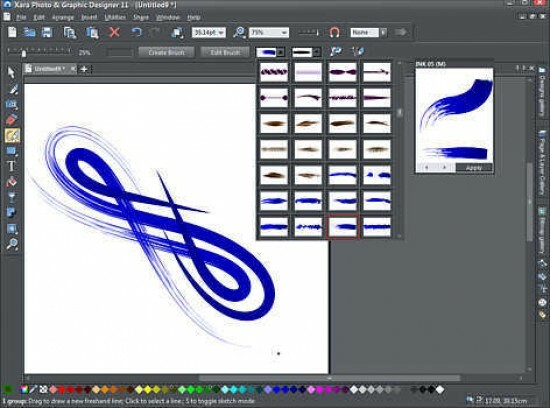 Users can, of course, create their own bitmap (photo) or vector brush designs. New to this version is the ability to sync files via Dropbox and Google Drive. So if a user has the same file open on multiple computers, and makes an edit then saves the file on one computer, it will be immediately updated in Photo & Graphic Designer on the other computers. As a bonus Dropbox and Google Drive maintain older versions of user’s files, thus providing an easy way of viewing and reverting back to earlier versions. This is a safe, easy and storage-saving way of maintaining multiple versions of website files. Fans of the Shape Painter Tool will love the extra flexibility offered by a new selection of vector shape editing tools (in the drop down list in the Shape Painter InfoBar). In the Transparency Tool 5 new W3C standard, web-safe and PDF-safe blend modes have been added - Overlay, Hard Light, Soft Light, Luminosity & Colour. There are new and improved text features including autocorrect (the ability to create a personal list of abbreviations that expand when typed), text background colour options, easy font replacement throughout an entire document, and more. There are also significant improvements to the PDF import and export. Xara Photo & Graphic Designer 11 includes two valuable free additions – the Premium version of MAGIX Online Photo Album to share photos with friends, families and colleagues (free for one year) and Photolooks 2, a powerful and flexible plug-in (previously sold by Red Giant for $199!) that can change the colour and light effects in a photo. It includes over 100 presets, but provides a powerful way of manipulating colour and light so that users can create their own custom effects. Xara Photo & Graphic Designer 11 costs just £49.99 inc VAT.